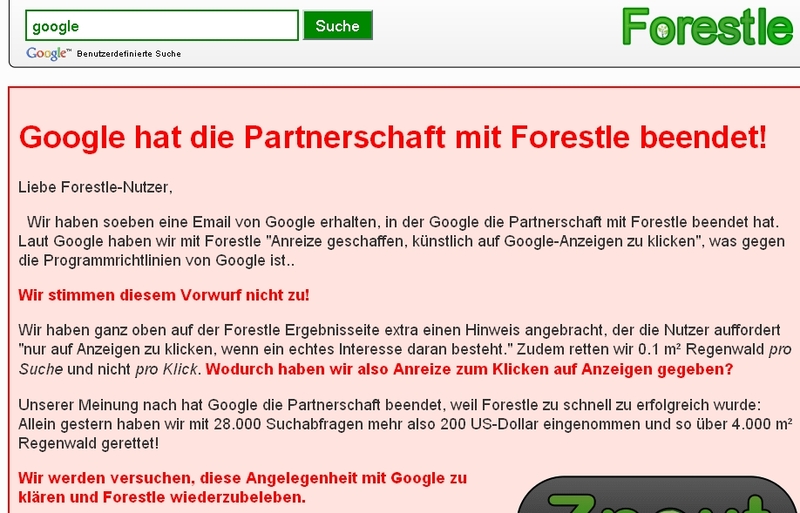 … telling you that Google quit its partnership with forestle. I hope it wasn’t me who did the math for Google … because really, what would this tell you about Google? On the other hand: what would this tell you about me? However: you wanna know my new firefox starting page? Well, it’s gotta be Znout… . Still, I am wondering how many other search machines POWERED BY GOOGLE there are to make this thing a daily event. Other than that: I hope you find what you’re looking for wherever you are with whatever tool you use! About one year after the establishing of Ecocho, an Internet search machine committed to global carbon exchange through reforestation, Google follows with Forestle. In cooperation with The Nature Conservancy and the Adopt An Acre project, Google helps to restore and maintain threatened natural habitats all over the world by donating all of their income through http://www.Forestle.org “minus administrative costs”. Every search through Forestle will preserve an area of 0.1m² which is about the size of a piece of paper in A3 format. Because every average Internet user is supposed to carry out around 1.000 Internet searches per year, this would add up to a surface of 100 m² of protected area. Imagine the total protected area surface if every single Internet user would go through Forestle! With 1300 Mio. internet users worldwide this would mean: Google funds 13 Mio. acres (130.000 km²) of protected area – which is about the size of Island. 2 years of Forestle-search and Google funds the Great Barrier Reef completely! However apparently Google is only interested in forest ecosystems for which reason ever. May they be more catchy in terms of marketing and advertisement “Ooh, yeah – let’s save the rain forest!” or may there be the actual carbon sink issue in the back of their Google heads, which both is great – don’t get me wrong. But if everybody goes through Forestle from now on: Who will pay for Google?